Welcome to this experimental SSB fantasy league! Here, you'll select a team of SSB fighters and we'll duke it out using your team. The rules are more specific in the RULES page. This site is an experimental version to see if it will work on the site I'm building. If this goes well, a fantasy league for SSBM will be on my new site. So please participate and follow the rules. 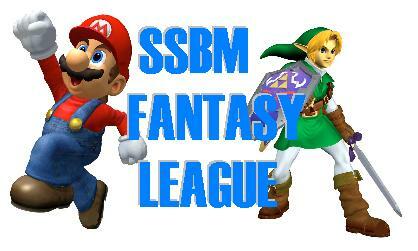 9/22/01 THE SSB FANTASY LEAGUE IS BORN! Please register on the "stadium" page before October 10th to participate in the league. Please join in the game so this league can be succesful. Thank You! 9/23/01 The Forums are up! The forums are up and running. To use them, you must be a registered league participant. I'll send you the password via email. There are four catagories of discussion. Please check them out. Thanks! Bye. An SSBM Fantasy will be made if this fantasy league is successful. So show your support and participate in the league.